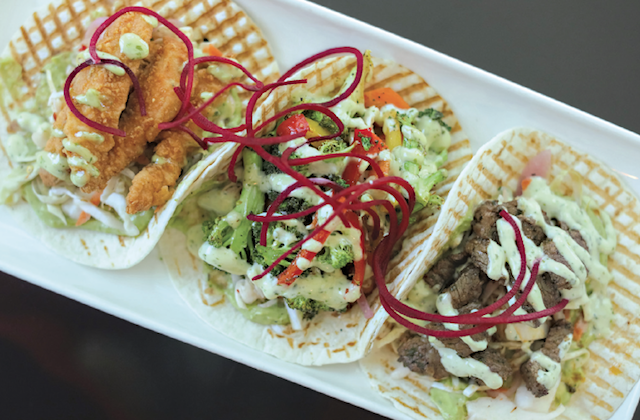 Taste 141 is a mecca for professionals and corporate up-and-comers. The restaurant exudes an energetic, successful vibe and is widely enjoyed for its friendly service and emphasis on feel-good dining. provides an impressive backdrop for this memorable eatery. Taste 141’s menu is a beautiful collaboration between well-loved culinary creatives, Chef Abdul and Chef John. Their combined passion for food is reflected in a colourful menu that highlights organic ingredients and locally grown produce. Intriguing flavour combinations are a mainstay in an array of delicious daily specials, ranging from artisan salads to homemade flatbreads. Their signature truffle fries are an absolute must-try. Friendly and knowledgeable, Taste 141’s wait staff is on hand to suggest the perfect wine pairing for your meal. Outside, a casual seating area adorned with lush greenery feels worlds apart from the rest of Hamilton. With shady umbrellas, potted palms and an extensive wine and beer list, it’s one of the best spots to sip specialty cocktails on a sunny afternoon. Taste 141 cultivates a boisterous happy hour tradition, especially during the summer when they host popular local bands and DJs out on the patio. The atmosphere is a hit, whether you’re mingling with colleagues or letting your hair down at the end of a long work week. In addition to a full lunch selection,Taste 141 offers light and healthy breakfast fare with plenty of gluten free options. The restaurant has also been voted one of the best spots to go for take-out. Bookmark their Facebook page for all of the daily offerings and to be the first to know about upcoming theme nights, which feature authentic cuisine and wines unique to a specific country. Book early as special events at Taste 141 always sell out well in advance!